Sri Lanka’s largest book Exhibition , Colombo International Book Fair (#CIBF 2018 - කොළඹ ජාත්‍යන්තර පොත් ප්‍රදර්ශනය) will be held at the Bandaranaike Memorial International Conference Hall (BMICH) from September 21 to 30, from 9am to 9pm. This is a great chance for Youth, Students, university students and School students to buy books, Magazines and Stationery at special discounts. 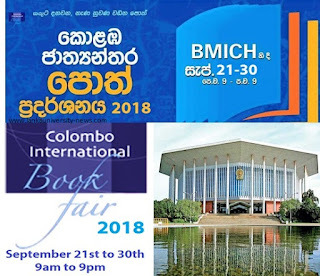 The Colombo international Book Fair 2018 will be held from September 21 to 30th at 9.00 am to 9.00 pm. The fair organized for the 20th year by the Sri Lanka Book Publishers Association say there will be about 400 stalls of local and foreign. Over 100 publishing companies will participate in the fair this year. Special Discounts will be given for Schools and Universities. Also discounts ranging from 5% to 70% are given at the Event and lot of Bargain Books available at the exhibition. The #CIBF2018 fair start at 9.00 am and end 9.00 pm. Last year Colombo International Book Fair (CIBF) was visited by a million customers during the nine days period. Large crowd will be visiting day time, hence if you want select books freely recommended visit at night. Special bus service has arranged from Bambalapitiya to Borella. Sri Lanka Police arranged special traffic plan and allocated special parking places.